The 1st ever Alabama Senior Olympic Pickleball tournament was held in Auburn, Alabama, on May 19, 2012, at the Indian Pines Golf Club tennis courts. 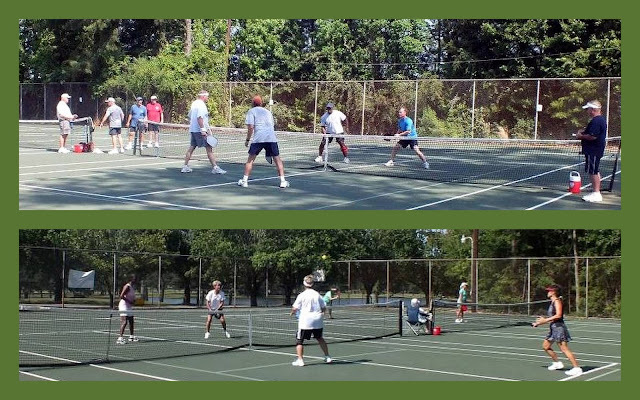 Two months previous to the tournament, the City of Auburn, redid the worn out tennis courts at the Indian Pines Golf Club and added pickleball lines to the courts. The tournament drew players from Louisiana (including Rayne Ambassador, Sharon Richard), Florida (including Ft. Myers Ambassadors Nancy Meyer and Cindy Eddleman), Georgia ( including Pine Mountain Ambassador, Cindy Moore) and Alabama. The tournament was a qualifier tournament for the 2013 National Senior Games to be held in Cleveland, Ohio. All players who played in our tournament were able to qualify for the summer games next year. We had a total of 19 players with men making up 12 of the players and women making up 8 of the players. Men's Doubles 50-59 (Pictured)1st - Sam Bailey and Jeff Hudson, 2nd - Byron Freso and Lee Washam, 3rd - Ken Riorden and Bill Hess. Mixed Doubles 50-54 (Bottom in photo) - 1st - Lee Washam and Cindy Moore, 2nd - Jeff Hudson and Nancy Meyer, 3rd - Sam Bailey and Crystal Guthrie. Mixed Doubles 55-59 - 1st - Byron Freso and Marsha Freso, 2nd - Tom Earley and Ann Earley. 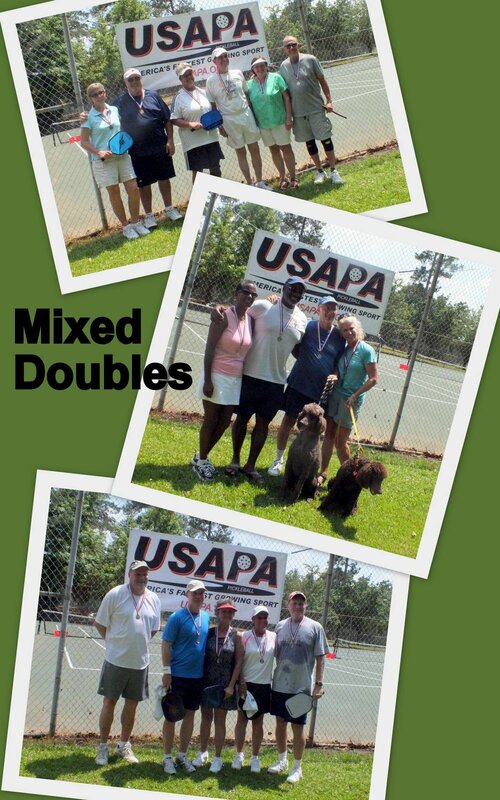 Mixed Doubles 60-69 (Top picture in photo) - 1st - Bob Huskey and Cindy Eddleman, 2nd - Bill Hess and Sharon Richard, 3rd - Charlie Scott and Dee Scott. Men's Singles 60-74 - 1st - Bob Huskey, 2nd - Bob Stauffer, 3rd - Bill Hess. Women's Singles 50-59 - 1st - Nancy Meyer, 2nd - Crystal Guthrie.